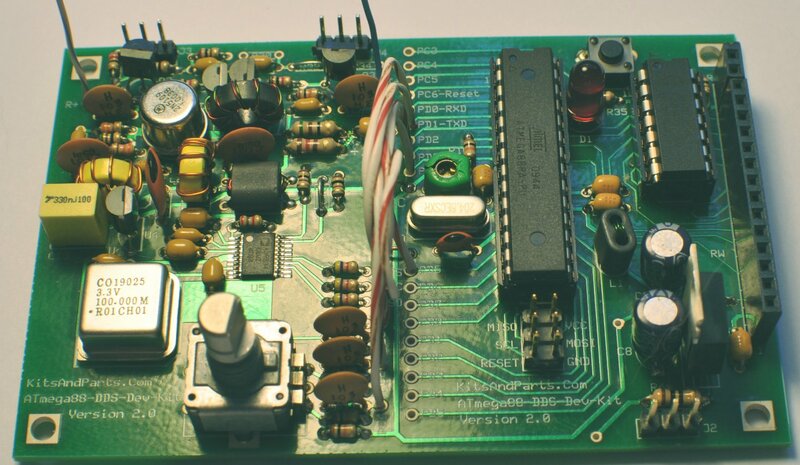 Direct Digital Synthesizer "Development Kit"
Click on the DDS Manual Link for information how the DDS works. The Kit includes two plastic parts bags; one with all the resistors; the other with the remaining parts. The parts bags may contain extra resistors and capacitors that are not used. 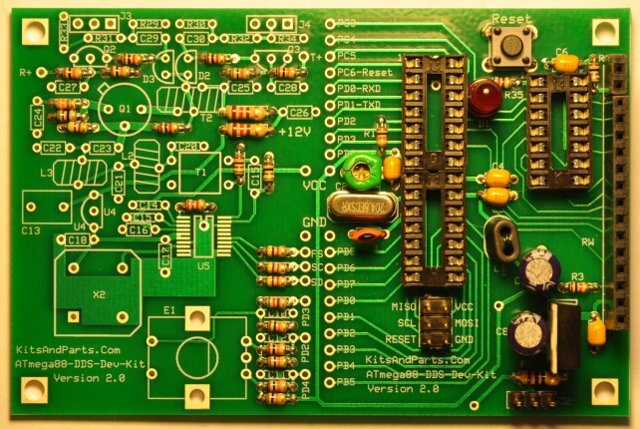 design your own Receive output level resistor pad. design your own Transmit output level resistor pad. 4. Install three 14 pin DIP sockets. ____Position the socket notches at PIN-1/14 and solder. 5. Install the 20.48 MHz Crystal about 1/32 inch above the PCB. ____Insert the Crystal in the PCB and tilt it; hold with one finger and solder. Straighten the XTAL. 6. Install the following capacitors on the digital side (right side) of the PCB. 7. Install type 43 ferrite binocular below C5. There are two binoculars in the parts kit; one has rounded corners and is shiny black, the other has sharp corners and is dull black. The shiny, rounded corners ferrite binocular is a type -43; the other is a type -61. Cut 4 inches of 30 GA green wire and insert 4 complete turns through the -43 binocular. One turn is defined are a wire running through BOTH HOLES of the binocular. Strip the insulation off the wires all the way down to the body of the binocular core. ____L1: Insert the BN-43-2402 binocular filter inductor (standing up) and solder. 8. Install Red LED at . ____D1: Red LED; note polarity (flat side) and solder. ____C8,9: 47uF; note polarity (+) and solder. 12. 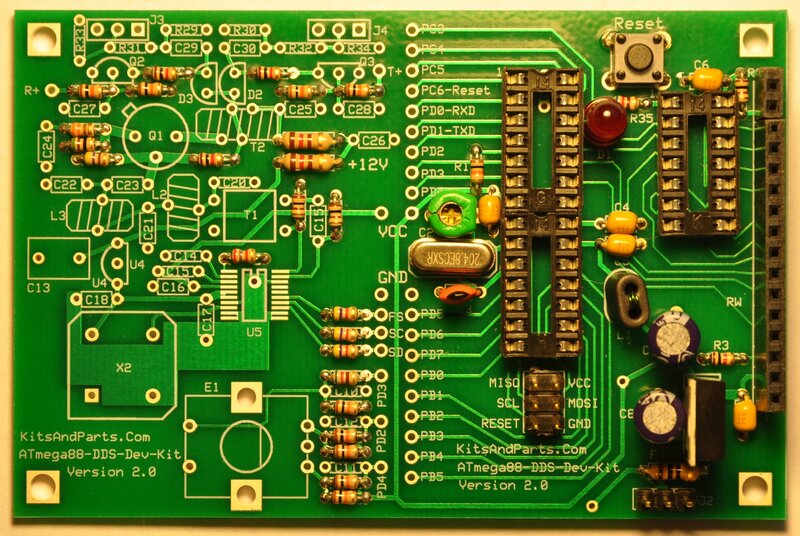 Install the 3 terminal voltage regulator in lower right corner of the PCB (not labeled). ____U3: LM7805AC; note polarity; Metal TAB toward C8; solder. Before installing the female LCD header, you might want to consider how and where you want the LCD to display. You may want to make an extension cable by soldering 16 wires between the PCB and the female header. ____Install and solder both male and female, header and socket. ____+12V + GND wires: solder. ____Measure 5 volts across C7; if not 5V then fix the problem before proceeding. Align the chip on the SMT pad, PIN-1 toward R12. Tack solder one corner of the DDS chip. Solder the remaining pins to the SMT pad. Use solder wick to remove solder shorts. Review soldering mess using high power magnifying glass, optionally check for shorts using ohm meter. 17. Install type 61 ferrite binocular above R12. Cut 8 inches of 30 GA red wire and insert 6 complete turns through the -61 binocular. The binocular holes are small so make sure the turns are tight to allow additional winding to be added. One turn is defined as one wire running through BOTH HOLES of the binocular in a U patern. Cut 4 inches of 30 GA green wire and insert 3 complete turns through the -61 binocular. The completed transformer should have 2 red wires coming out one end of the binocular and 2 green wires on the other end. ____L1: Insert the BN-61-2402 binocular transformer (red wires toward R13), pull leads tight and solder. 18. Install the following capacitors on the DDS side (left side) of the PCB. Note that C15 is labeled twice (in error) on the PCB. C15 in the next step is between C14 and C16. 19. Install T2, a bifilar wound transformer. 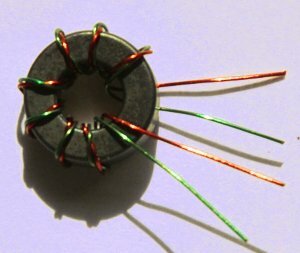 Prepare 8 inches of 30 GA dual red/green magnet wire. Twist tightly to about 4 twists per inch. Wind 8 turns, evenly and tight through the body of the FT37-43 ferrite toroid. Trim leads to about half inch from the toroid body. Remove insulation up to the body of the ferrite. 4. RED WIRE connect to R19. ____FT37-43 Strip and Tin leads; and install. 20. 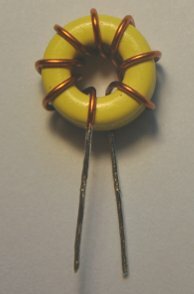 Install two T30-6 yellow toroid inductors (low pass filter cores). Prepare 2 pieces of 7 inches of 26 GA red magnet wire. Wind 8 turns of the wire through one yellow toroid. Repeat for the other toroid. Strip the insulation off the wires all the way down to the body of the toroid cores. ____L2,3: Install the T37-6 toroids (standing up) and solder. ____Q1: 2N5109 - install about 1/16 inch or 2 mm above the PCB. ____Q2,3: 2N3904 - install with about 1/4 inch or 6 mm leads above the PCB. Observe polarity and do not overheat. ____D2,3: MPN3700 - install the PIN diodes all the way against the PCB. Observe polarity and do not overheat. 25. Install the Rotary Mechanical Encoder, a pulled part recycled from a Panasonic AM/FM Auto Radio. The following step installs jumpers but could be replaced with inductors to possibly reduce circuit noise. ____VCC: Install a jumper at VCC located in the center of the PCB and to the left of the trimmer capacitor. ____GND: Install a jumper at GND located at the lower left of the 20.48 crystal. ____PD4: Connect PD4 from the Encoder to PD4 on the ATmel CPU. ____PD2: Connect PD2 from the Encoder to PD2 on the ATmel CPU. ____PD3: Connect PD3 from the Encoder to PD3 on the ATmel CPU. ____PD5: Connect SD from the AD9834 to PD5 on the ATmel CPU. ____PD1: Connect SC from the AD9834 to PD1 on the ATmel CPU. ____PD0: Connect FS from the AD9834 to PD0 on the ATmel CPU. the IC legs on a flat table and push/press the body of the IC against the table. DO both sides. 29. Connect the LCD to the PCB. Current consumption should be about 120 milliamps. When the DDS powes up, the LED should flash twice and then the LCD should display 10,000,000 Hz. provided that there is no resistor pad in the output section on the PCB. 31. Assuming that all is OK to this point, the next step is to set up the DDS as a development platform. Still step is optional; not required if you plan to use teh DDS Kit as a Sig_Gen or VFO. Click on the Development Platform Link for information to update and/or modify the firmware.